The 2nd Canadian Labour International Film Festival will be coming to Guelph on November 28 for a special Festival-in-a box screening at the Guelph and District Labour Council, 141 Woolwich Street, (Matrix Building, Woolwich and Eramosa) starting at 2.00 p.m.
CLiFF aims to increase awareness about labour issues worldwide by screening short films about workers and the conditons under which they live in over 50 locations across Canada about workers and the conditions under which they live and work. Twenty-two Canadian and international films have been selected for the festival, nine are Canadian, four American, two British, and one each from Australia, Egypt, India, Pakistan, Singapore, Turkey and the Netherlands. The Union Song (2010). A short video featuring a bluegrass song about how all members of the education community work together to keep the public school system strong (3 minutes). Special Pass (2009). A documentary about a group of foreign workers in Singapore who attempt to seek shelter and support themselves while out of work. This is the lesser-known story of foreigners who receive little support in a country that, ironically, was built by the work of immigrants (24 minutes). Sudden Wake (2009). The story of the struggle of Egypt’s first independent trade union – the Real Estate Tax Authority Union (RETA). RETA was formed in December 2008, one year after tax collectors there held a two-week sit-in in front of the Cabinet Building. They face constant harrassment from the Egyptian government as well as the country’s official labour federation, the ETUF. Red Dust (2010). The incredible story of resistance, courage and hope by women workers in China battling cadmium poisoning and demanding justice from the local government and their employer, a multi-national battery manufacturer (20 minutes). Scotty Hertz, host of The Working Week on CFRU 93.3fm and one of the organizers of the CLiFF Guelph screening will be one of our guests on Royal City Rag during our second hour on Saturday November 27 (9-10 a.m). Remember if you don’t catch Royal City Rag live, you can always pick it up later that day via the CFRU archive or on this website a day or so later. Significant changes have taken place in Bolivia since the election of Latin America’s first peasant-indigenous President, Evo Morales. in 2006. 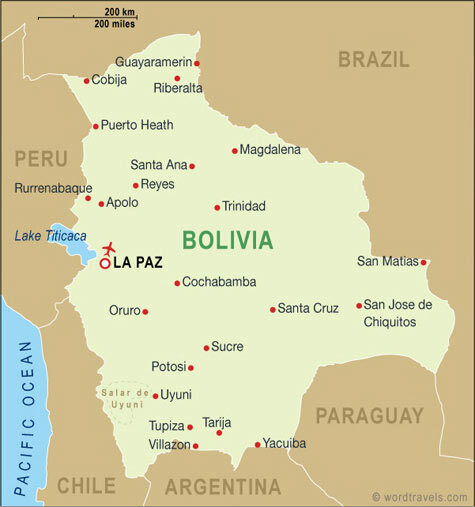 In addition to approving a new constitution that establishes the continent’s first plurinational democratic state, Bolivia was the site of the World People’s Conference on Climate Change and the Rights of Mother Earth held last April 2010. A Canada-Bolivia conference and solidarity event: Canada-Bolivia Relations in the Next Decade will be taking place here at the University of Guelph on Saturday, November 6. This is a unique opportunity to experience and understand the impact this has had on the people of Bolivia. The special guest speaker for the event will be Hugo Salvatierra Gutierrez, former Bolivian Minister for Rural Development, Agriculture and the Environment in the Evo Morales government and director of ALAS (the Office for Legal Advice and Social Advocacy), an office that works with labour, peasant and indigenous organizations in Santa Cruz, Bolivia. Saturday, November 6 from 9.30 a.m. and until 5.30 p.m.
An evening of traditional Bolivian culture to follow. Guelph Wellington Health Coalition are presenting a townhall meeting on November 2 in War Memorial Hall at the University of Guelph regarding the impact of private health insurance on Medicare featuring guest speaker Marie-Claude Premont. 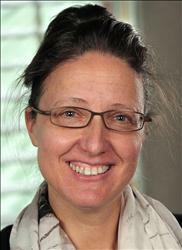 Marie-Claude Prémont is a law professor at École Nationale d’Administration Publique in Montréal, (National Public Administration School) . As well as being a member of the Quebec Bar Corporation of Quebec, she teaches and does research in the field of Health Law and Municipal Governance. She has been closely following the impact of the Chaoulli 2005 Supreme Court decision concerning private health insurance and delivery. What does this mean for Medicare and the sustainability of the Canada Health Act? Friends of the Guelph Public Library are busy preparing for their fourth annual giant book sale to be held Friday, October 29 through Sunday, October 31. This year’s location, the former FastForms building at Massey and Imperial Roads, offers extensive sorting and sales space, convenient bus access and plenty of free parking. The Friends, a group of community volunteers, are committed to supporting the Guelph Public Library through advocacy and special programs. Proceeds of approximately $40,000 from earlier sales are invested toward a Friends project to serve children and young adults in the future new Main Library. The sale will take place in the former FastForms building, 251 Massey Rd at Imperial Rd., in the business park to the west of the Hanlon Expressway. For additional information, visit the Friends website at www.friendsguelphlibrary.ca. Catch Virginia Gilham from Friends of the Guelph Public Library talking about their 2010 Book Sale on CFRU93.3fm ‘s Royal City Rag on Saturday October 23 between 9-10 a.m.
During the week of October 18 – 24, Guelph will join others from around the world to mark Open Access Week. Talks will be followed by discussions and refreshments. 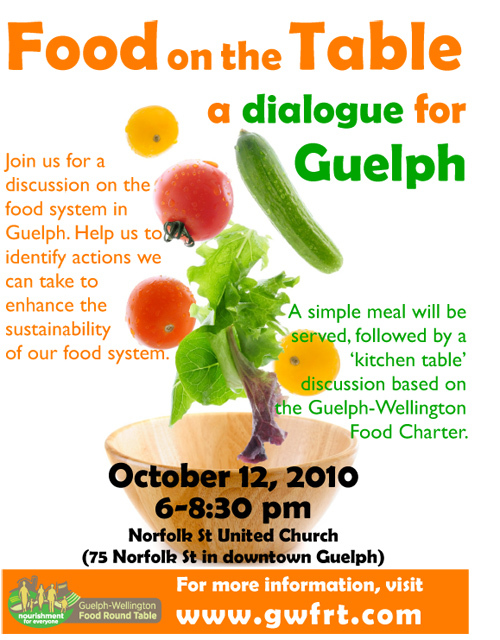 Space is limited so be sure to RSVP to: researchshop@uoguelph.ca. Unfortunately, this venue is not wheelchair accessible. Catch Wayne Johnston, Head of Research Enterprise and Scholarly Communication at the University of Guelph Library talking about Open Access Week on CFRU93.3fm ‘s Royal City Rag on Saturday October 16 between 8-9 a.m.
For more information, visit Guelph Wellington Local Food.